A 20-year strategy has been launched to create a Midlands Rail Hub that is expected to be worth up to £649 million a year to the region’s economy by 2037. The new strategy, announced by Secretary of State for Transport Chris Grayling and emerging sub-national transport body Midlands Connect on July 9, aims to create six million extra journeys while also improving the speed of east-west travel. It could also enable up to £22 billion worth of goods to be moved from the road to the rail network, by creating a further 36 train paths per day for freight. According to Midlands Connect’s Our Routes to Growth report, in which the new strategy is contained, delivering these benefits would require implementation of a programme of enhancements to increase capacity. These enhancements include longer and restored platforms, improved junctions and signalling, and some minor electrification, which would need to be completed by 2026 to allow some new services to run in time for the arrival of HS2 Phase 1 in 2026. Proposals for the Midlands Rail Hub would double the number of trains per hour between Birmingham and Nottingham, Leicester and Hereford. 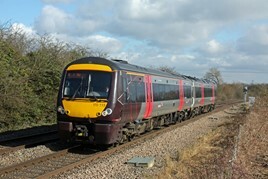 Journey times would also be reduced from 69 minutes to 50 minutes between Nottingham and Birmingham, and from 84 minutes to 60 minutes between Hereford and Birmingham. In turn, this would improve access to the city’s planned HS2 station at Curzon Street for businesses and communities in Herefordshire, Worcestershire and south Wales. For the FULL story, read RAIL 857, published on July 18, and available digitally from July 14 on Android/iPad.